Since it's Friday you'll probably be expecting a Friday favourites post, but honestly I just feel like I'm starting to repeat myself week after week and there's not really any need for that since I rave about things enough already. So because of that, Friday favourites posts won't be happening anymore and instead I'll be returning to monthly favourites posts so bring on July so I can get the first of those posts out (and will be counting down the days until our holiday, eee!). Today's post is all about my favorite cleansers and as a beauty blogger one of these definitely won't be a surprise since Cleanse & Polish fever is always hitting the blogging world. 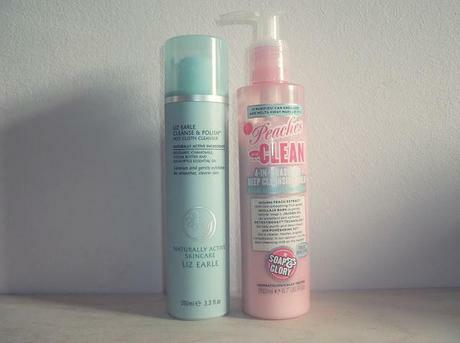 For the past few months I have been using the Liz Earle Cleanse & Polish Hot Cloth Cleanser and the Soap & Glory Peaches and Clean Deep Cleansing Milk for taking off my make-up and cleansing my skin in the mornings and evenings. I tend to use the two cleansers on rotation as my skin seems to get too used to a certain product after a fair amount of time so I like to switch up between the two from time to time. The Liz Earle Cleanse & Polish hardly needs an introduction as it has received countless awards, great reviews and praises from so many people and I'm sure you will all have heard about it by now. This cleanser is very nature orientated and this is clear from its ingredients and overall scent (which I adore) and I believe that I can really feel it leaving my skin free of all make-up and impurities after use. I tend to use about two pumps of product all over the face when removing my make-up, and the muslin cloths included in the starter pack are great for that extra bit of exfoliation without leaving your skin feeling raw. I seem to reach more for this cleanser when my skin is playing up, whether that be with dry patches and flakiness, break-outs or just for general use when I've been wearing heavier make-up which requires that bit more force to remove. The second cleanser in my rotation is the Soap & Glory Peaches and Clean and firstly I just have to say that I am in love with the scent of this milky cleanser. Of course the name gives it away but it has the scrummiest smell of peaches which makes using the product even more of a pleasure. Again I use about two pumps worth of product to cover the face and then remove with a muslin cloth, and I'm always amazed at how soft this cleanser leaves my skin. I would say that make-up removal is a bit more work with Peaches and Clean as opposed to the Cleanse & Polish and therefore I tend to reach for this bottle more when I have been wearing lighter make-up or my skin just needs a freshen up, but either way skin is always left feeling squeaky clean and free of any dirt or make-up. 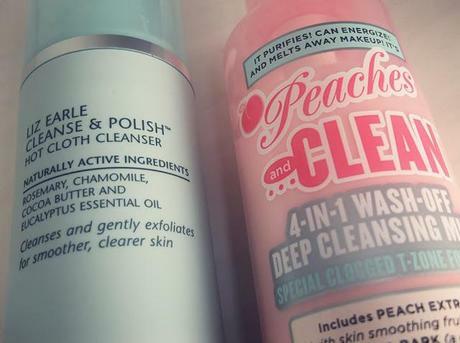 What are your go-to cleansers?